Hard boiled egg (de-shelled), 4-5 nos. Onions (medium size), 2 nos. Tomato (medium size), 2 nos. In a pan, dry roast cloves, cinnamon, chillies, coriander seeds, black pepper, cumin seeds, fennel seeds for couple of minutes till the aroma starts to come. Now add the poppy seeds, roast for another minute. Then add grated coconut and turn off the heat. Let this mixture cool and grind it into a fine paste and set it aside. Heat oil in a pan, add mustard seeds and fennel seeds and fry for a minute, then add curry leaves along with onion and fry till onions turn translucent. Now add the ginger garlic paste and fry till the raw smell goes. Now add the tomato puree and cook for 2-3 minutes. Then add the ground masala paste along with turmeric powder and cook for another 3 minutes. Now add 1 - 11/2 cups of water and required salt and bring it to boil and let it simmer till the gravy thickens to required consistency. In the mean time in a pan, slightly fry the boiled and de-shelled egg with a teaspoon of oil and a pinch of salt for a minute. Turn off the heat, add a pinch of chilli powder and mix well. Now add this egg to the gravy mixture and let it simmer for another 2-3 minutes. Then turn off the heat. Garnish with cilantro and serve it with rice/ roti. This is a slightly spicy gravy. Adjust the red chillies and pepper powder as per your personal taste. Instead of using ginger garlic paste, you can use 4-5 garlic cloves and a 1 inch long ginger piece. Clean, peel the skin and pound them well and use or you can puree them with tomato and use. Mouth watering recipe dear, my favourite kulambu !!! Have made this, and all loved it. 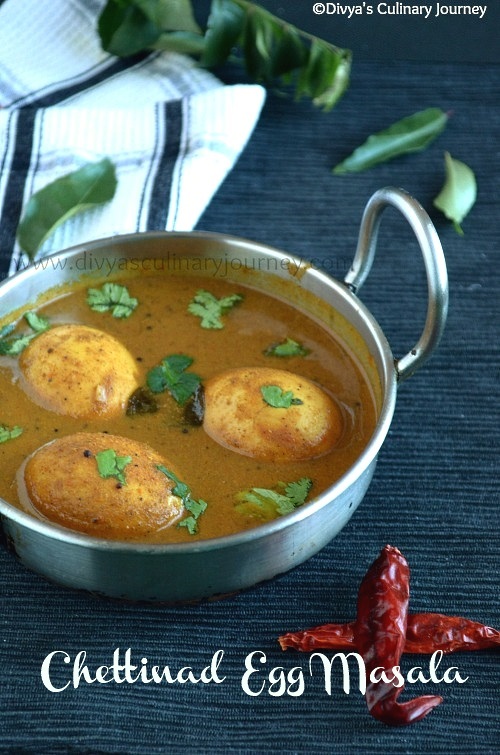 Egg chettinad is a spicy and tasty curry. Yours looks very delicious. 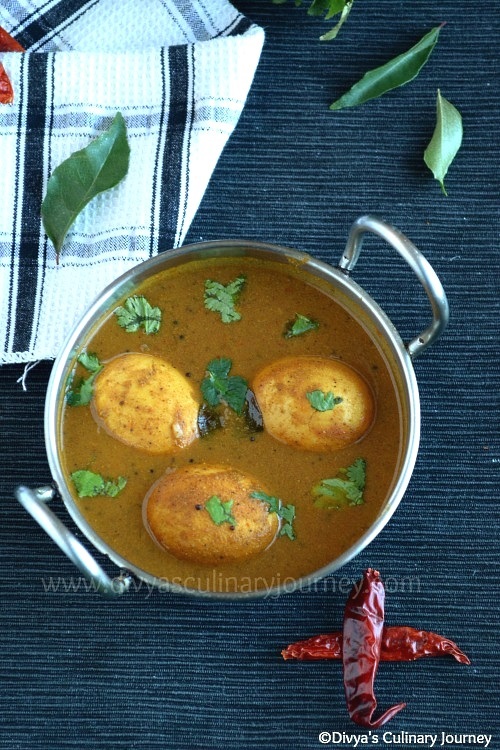 delicious egg curry. Always love chettinad food. This is very inviting. Nice one for chapathis or rice. Wow ! curry looks delicious. 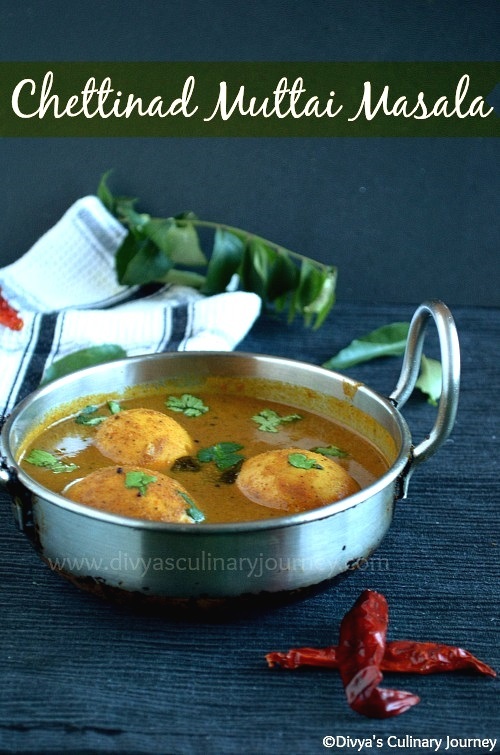 Cannot forget this virtual treat,you guys made my day and I am so happy and feeling excited..Egg curry looks so tempting and your clicks make me drool..
Super tempting and spicy egg masala...looks very inviting da!